This infographic by Goldman Sachs gives a good picture of how Millennials think and act. Millennials are the biggest reason why organizations need to transform. Fast. It can seem like there is too much noise on IoT. But caught in the noise are some real signals that IoT is coming of age, with Amazon Echo being the latest and greatest example. Bill Gates’s quote below on change is apt for IoT. It’s better to get started on IoT now instead of waiting because it is hard to get IoT right. It might even take your organization several iterations and nontraditional product development introduction approach. 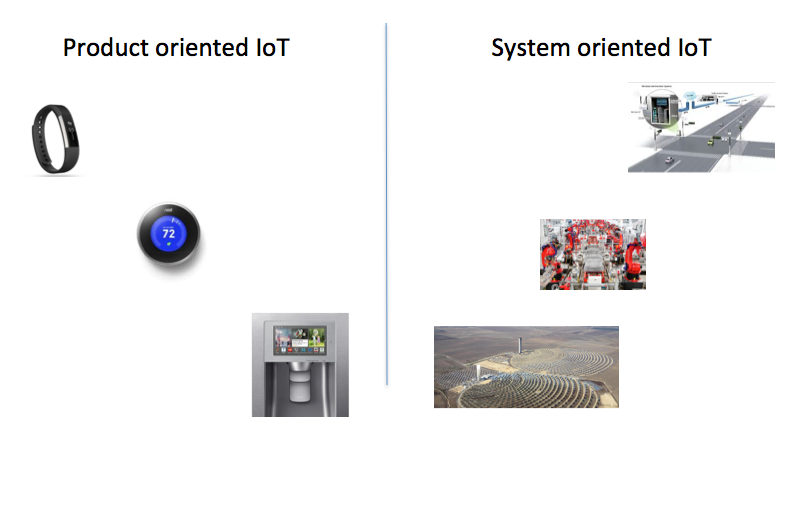 The more one looks at IoT design and implementation scenarios the more it becomes apparent that there are 2 patterns: Product oriented IoT and System oriented IoT. Product oriented IoT design is primarily related to an individual product and its function. Examples include thermostats (and connected HVAC unit), fitness bands, refrigerators and many products in industrial markets. System oriented IoT design is usually applicable for a complex system that is made of several individual products/components working together. Examples include manufacturing plants, utilities (energy, water, transmission, etc. ), traffic management systems, autonomous cars, smart homes, etc. For a number of very good practical and business reasons most of the focus of IoT marketing hitherto has been on Product oriented IoT use cases and scenarios. The Connected Prduct trend is new and is hitting its stride and will very likely become the norm for a number of product categories in consumer and industrial markets. It is also a little easier from an adoption perspective because the decision making usually rests with a single person or a small group. Remarkable advances in low power computing, widespread availability of mobile communications and broadband, and the rise of cloud computing have made Connected Products the dominant design pattern. The objective of Product oriented IoT, among others, is to improve customer engagement and support, extend the product with additional capabilities with supporting cloud infrastructure and provide the product manufacturer with intelligence on product usage and performance. The analysis and optimization aspects are simpler and usually pertain to the function of the product. The System oriented IoT is necessarily more involved and complex and its impact is usually felt at the organizational, community or society level. The value of System oriented IoT, when it works well, can be significant to the organization, community and to the society it serves. System oriented IoT tends to solve a higher level or organizational problem. In addition, it needs to connect, manage and orchestrate disparate components towards a higher, system level goal. For instance, the goal of a System oriented IoT for a manufacturing plant is to optimize production flow while minimizing poor quality and costs. System oriented IoT has also had a significant historical and technological underpinning in the form of proprietary control systems, communication protocols and data management systems. I am officially naming the 3 companies, Alphabet, Amazon and Apple, as the “Disruption Posse”. They have gotten into the habit of smelling poorly served markets, complacency and in all cases a belief that they can make significant contribution to enter new markets with compelling products/services. The incumbents should be in for a rude shock and prepare for eventual obliteration of normal (cushy) business models and operations when they sense a possibility of any of these companies entering their markets. The reason why I pick these the three companies to be part of this exclusive posse, and not VC funded startups, is because of their scale and market reach. Each of the companies have direct relationships with hundreds of millions of prospective customers and have the logistical and financial resources to go after large global markets. So here is list of industries/markets that are disrupted or about to be disrupted by the Posse. I will keep updating the list as the disruption or its possibility unfolds. I suspect Digital Transformation is at the top of the minds of executives of established organizations based on the number of blog posts (including this one), pithy tweets, dense infographics and ponderous white papers that I see these days. The Chief Digital Officer role may eventually prove faddish, but the theme itself will be a constant source of anxiety. The anxiety is primarily because of the occasional forays into various industries by the “Disruption Posse”. The Disruption Posse is made up of Amazon, Alphabet and Apple. What is unique about these types of projects is that there is a cloud of uncertainty in terms of what works, how things should be designed, what is effective and user adoption. These are the same questions that entrepreneurs and new product development teams have to answer when developing and introducing new products. Too large or too small a product (project) are big problems. The MVP is the difficult-to-determine sweet spot between them. MVP is a mindset of the management and development-team. It says, think big for the long term but small for the short term. Think big enough that the first product is a sound launching pad for it and its next generation and the roadmap that follows, but not so small that you leave room for a competitor to get the jump on you. The notion of MVP doesn’t stop at product. Ask, ‘What is minimum viable…” anything and you’ll discover that it applies to most business-model decisions, not just product: market segments, customers, services, channels, promotion, and more. You can see from SyncDev’s website that many companies successfully launched transformational products using MVP approach. If your organization’s Digital Transformation efforts are going to primarily rely on homegrown innovation as opposed to buying startups, my recommendation would be that your organization should promote and become good at MVP approach. It’s hard to design good products. Even exemplary companies like Apple get it wrong every now and then. Dieter Rams, the legendary designer who inspired generations of designers, outlined 10 principles of good design that I wish designers of connected products and IoT apply. I tapped "Living Room." The icon—not the lights—went from dark to bright. I tapped "Living Room," and the icon went from bright to dark. The lights seemed brighter than ever. "How many gadget bloggers does it take to turn off a light?" said the friend, smirking. "I thought this was supposed to be a smart home." I threw my phone at him, got up, walked ten feet to the switch. One tap, and the lights were off. Allison’s rant on IoT in NY Times is all too real. IoT’s future is bleak as long as designers are adding new technology for the sake of technology or mindless innovation and are less concerned about effectiveness and usability. I am still not dejected, however. Amazon’s Echo gives me hope that some companies may be on the verge of figuring this out. A priceless addition to the Internet. A resource that will be used over and over and over. What impressed me more than the raw numbers about Didi Kuaidi is how aggressive and entrepreneurial the company is in many parts of the world. It has fingerprints of Jack Ma’s inclination to go ALL the way. In the age of social media it’s hard to pay attention to more than 2 paragraphs of text at a time. It’s highly unlikely that you will find the time, interest and initiative to read 167 pages of the ominous sounding “Future of Jobs” report from World Economic Forum (WEF). So we did for you, subtracted all the fluff and abridged the report into this lucid post. First a few bullet points. Advances in genetics, artificial intelligence, robotics, nanotechnology, 3D printing and biotechnology are laying a foundation for a revolution. Most occupations are undergoing fundamental transformation. Some jobs are threatened by redundancy, other growing rapidly and existing jobs require change in skill sets. Most of the drivers support job growth. A few, including geopolitical volatility, artificial intelligence, could lead to job losses. Computing, mathematical and engineering job types will see the highest growth prospects, while office/administrative and manufacturing/production job types will see contraction. The authors of the report themselves admit that the report does not offer any prognosis for the largest segment of job type in the world, especially in developing economies; Farming, Fishing and Forestry. Two new job types that were most frequently mentioned are data analysts and specialized sales representatives. 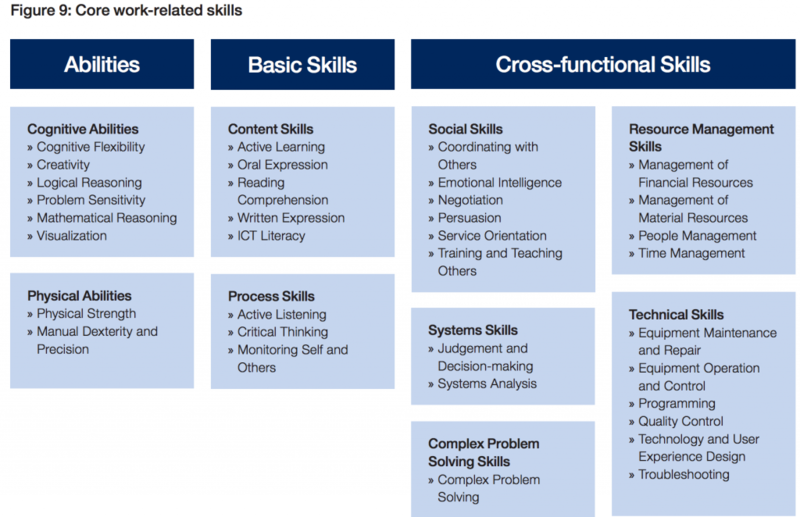 The report highlights core work-related skills (Figure 9 – Page 21) that seemed to have come out of a Common Core evaluation form. The report has a lot more information on above topics, different regions of the world and industries. It is a worthy effort to understand how HR departments in large companies perceive the jobs conundrum. The report would be lot more comprehensive if it had covered the crystal ball for the vast majority of people that work in the informal sector in the developing world and emerging economies.